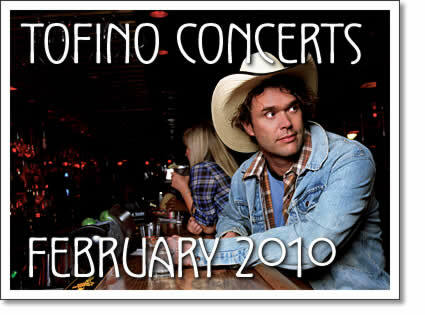 The following concerts in Tofino are happening in the month of February 2010. Tickets are available at Tofitian and Long Beach Surfshop in Tofino. Corb Lund is a Canadian musician/cowboy/3rd generation Albertan rancher who has crafted an exhilarating style of Western music. The sound is tough to categorize but the mix of roughnecks, bikers, bankers, and ranch hands you'll see drinking and standing shoulder to shoulder at one of his concerts will all agree, Corb Lund is authentic. Lund was born and raised in rural Southern Alberta. He has been singing about his country upbringing for more than a decade. Lund's music reaches across genres allowing him to appear at varied major festivals worldwide from the main stage at Glastonbury in the UK and Virginfest in Canada to a cowboy poetry festival in Nevada. Red Chamber straddles traditional and contemporary, whether it be ancient Chinese string band music seldom heard in the west, bluegrass, or jazz fusion. These virtuosic performers set the stage on fire with hot licks, power and passion! Red Chamber takes its inspiration from the traditional Chinese 'Plucked String' repertoire that is seldom if ever heard in the west. Featuring only plucked strings. Red Chamber creates a unique sound while performing a repertoire that spans centuries, including transcriptions from the Tang Dynasty (618-907), to modern compositions. Red Chamber is exploring other genres of plucked string music like Bluegrass, jazz, and a host of other folk traditions. This is an exciting ensemble of masterful musicians bringing a new sound on ancient instruments to the concert stage. Tofino concert listings from Tofino Time Magazine. Shows at the Tofino Legion and other music events in Tofino in February 2010.